USB install through the firewall. It's been through numerous car washes and rain driving - no problems. The USB cap I have on it works perfect, but it wouldn't recommend this spot without one. Just for throwing ideas out there, You guys know that rubber flap that goes over the ECU, that where I have the USB. Fairly safe IMO. bimmer335i07... Thanks for the DIY. Very easy, following your instructions and pictures. I think I may just tuck the USB cable under the top of the floormat and put my netbook in the passenger floorboard when logging. Of course it literally just started raining the minute I finished, so I guess I will update from my current 2/17/10 firmware and log on the way to work tomorrow. Last edited by ktmsmr12; 03-28-2010 at 02:45 PM..
Quick question, is this the same way to install it on 135i's as well? I was able to do it without unpluging any of the harness....just pull al lthose grommets up...unclip the whole bracket at the rear of the compartment behind the ecu and lift everything up and forward....easy to get to that hole. Where did you unclip the whole bracket and lift everything up? Please show me how by referring to one of the photos above. Thanks. When I saw the DIY for how the Proceed guys' ran theirs, I knew I could get to the hole in the ECU box by just pulling out the DME. You obviously wont see the quarter size hole like you do when everything is removed, but you CAN see it so you know where to feed the usb. I'm just a real big lazy a$$ sometimes so I wanted to do it with the least amount of work involved. If you're installing your JB3, takes an extra 5-10 minutes to route through and into the glove box. I searched around but I was unable to find this link. I'd prefer to make this job as easy as possible without having to remove everything. Does anybody have the DIY for the proceed referenced here? I just want to check it for the pics. Damn that was easy! Thanks! If you need help installing your JB3, let me know. I live in Union, NJ. Thanks for the great post on. 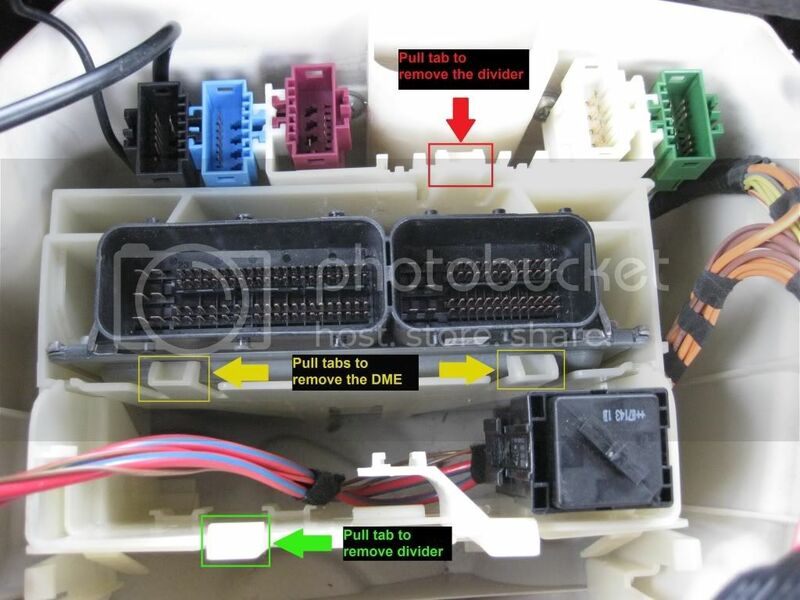 Do you think the cable can be passed thru without removing the ECU? Perhaps with a very long needle nose pliers to push the USB end thru? I tried fishing thru with a bent snake & wire from above couldn't get it thru the firewall. I'm just nervous about emptying the whole box. Just did another install yesterday. You actually don't need to remove everything. Just remove the divider/sleeve (not sure what you call it) closest to the cabin. Basically, just pull the tab (RED) in the pic below and pull out that sleeve/divider. That should give you enough room to stick the USB cable down the hole. Remember, you don't need to force the USB, just stick it through a little and it will come out in the cabin. Thanks for taking the time to post the picture. Did you remove the divider so the cable can be fed horizontally thru the hole vs. on a downward angle? I'll tackle this in a few weeks when I have some time & will be sure to post some pics. Yes, by removing that 1 divider (leaving all wires plugged in), that will give you enough room to feed the USB cable down horizontally through the hole. Thanks for the DIY post, it was very simple to follow. Just wanted to add that on my install, I ended up using a T15 torx for my 2 screws holding the panel under the glovebox. Other than that everything else was spot on exact. BTW the pics helped out alot. 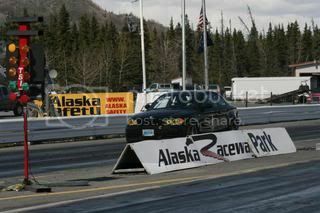 12.07@ 113.94 1.7 60' on 9/03/11 "Fastest 135i in Alaska"
IF YOU HAVE NOT DONE THIS YET: Here's a WARNING to those of you who are always trying to find a faster & easier way to do something. Due to an extreme fear of yanking the ECU I tried fishing the cable thru the hole that is visible as soon as you remove the ECU box cover. NOTE: this hole goes to a small fan on the interior of the car and is the WRONG hole! You can even fish a snake thru this hole into the interior, but will not be able to get the USB cable thru it. After wasting about 5 hours on 2 separate attempts I went to a penskeparts diagram to see that I was fighting the wrong battle. I was able to get a very minor win. By removing the grommets, lifting the removable ECU carrier about 1/2" and fishing one of my half dozen snakes from the interior to the ECU box, I pulled the cable back into the interior w/o removing the ECU. If I had to pay a dollar a curse word, I’d be broke. One thing that i really want to know is ,,, do u really need to unplug the battery ?? cuz wouldn't it reset all the electronic settings in the car like radio and etc. That's what I thought .. How about dealer visit? Can it be left in or would be a good idea to take it out before hand ? No if you are not disconnecting the ECU. If you are going to empty the box, I would follow the sticky & disconnect the battery. when in doubt- take it out. It doesn't take long after you have done it a time or two- maybe 20 minutes. The pictures were a great help making this DIY fairly straightforward but I'm surprised no one has mentioned what to me was the hardest part, namely having enough space to jam the JB3 with the adapter cable attached inside the ECU box. It's a pretty tight fit and requires some careful repositioning before everything is buttoned up.